The President of India, Shri Pranab Mukherjee will inaugurate two restored Clock Towers on July 24 and 25, 2015 respectively at the President’s Estate to mark the completion of the third year of Presidency. These clock Towers in Schedule ‘A’ and Schedule ‘B’ areas of Rashtrapati Bhavanare heritage structures built by Sir Edwin Lutyens in 1924 and 1925 respectively. The Schedule ‘A’ Clock Tower was built as an Institute for men of the President Body Guardand had reading and recreational rooms, canteens, etc. Since, 1947, it has been occupied by the President Body Guard as its Regimental Head Quarter. The Schedule ‘B’ Clock Tower was known in the past as Band House and used for residential purposes. Both the Clock Towers are centrally located in the avenue which runs diagonally and is part of the original design intent of Lutyens. The clock system installed in the tower at Schedule ‘A’ is inscribed with the name “Pulsynetic”, which indicates that its manufacturer was Gent and Company of Leicester, UK. The Gent and Company’s electric clocks adorn many important buildings around the world. The clock system installed in the tower at Schedule ‘B’ is inscribed with the name “J.B. Joyce & Co. Ltd, Whitchurch 1924”. The J.B. Joyce & Co. clocks also adorn many important buildings around the world. Restoration work of both the Clock Towers has been done by INTACH while repair of Clocks has been done by IIT, Delhi. The buildings were precisely documented and analyzed prior to the restoration work. The restoration undertaken includes preservation of original plaster, Kota stone flooring, repair of conical obelisks, cleaning and painting of fire places etc. as per original design. 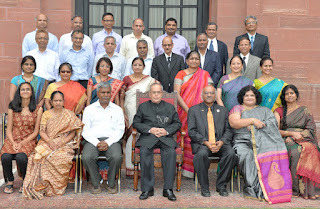 The President, Shri Pranab Mukherjee with the Alumni of the Indian Statistical Institute, Kolkata, at Rashtrapati Bhavan, in New Delhi on July 23, 2015. A group of alumni of Indian Statistical Institute called on the President of India, Shri Pranab Mukherjee today (July 23, 2015) at Rashtrapati Bhavan. Speaking on the occasion, the President welcomed the alumni of Indian Statistical Institute (ISI) to the Rashtrapati Bhavan and said that ISI is a leading institution in our country for research, teaching and application of statistics, natural sciences and social sciences. It is a unique institution whose foundation was laid by Professor P.C. Mahalanobis. Prof Mahalanobis who is known for his pioneering work in applied statistics is credited for the economic planning model that India implemented in its Second Five Year Plan. The President stated that alumni as a body can contribute substantially in the development of an institution. Most of the world famous educational institutions have developed as a result of the contribution of their alumni. He wished that the attachment of the alumni of ISI to their alma mater would result in the productive development of this great organization. The President of India, Shri Pranab Mukherjee will inaugurate the renovated President’s Estate Clinic on July 24, 2015 to mark the completion of the third year of Presidency on July 25, 2015. The Vice President, Shri Mohd. Hamid Ansari being presented a book entitled “Journey of a Curious Mind” authored by Dr. Jagannath Patnaik, in New Delhi on July 23, 2015. The Member of Parliament (Lok Sabha), Shri Prasnna Kumar Patsani is also seen. The Vice President, Shri Mohd. Hamid Ansari being presented a book entitled “Lord Jagannath” authored by the Member of Parliament (Lok Sabha), Shri Prasnna Kumar Patsani, in New Delhi on July 23, 2015. The Vice President of India Shri M. Hamid Ansari was presented with two books entitled “Journey of a Curious Mind” authored by Dr. Jagannath Patnaik and another one entitled “Lord Jagannath” authored by Shri Prasnna Kumar Patsani, Member of Parliament (Lok Sabha) here today. The Vice President complimented the authors for bringing out such valuable books. The Prime Minister, Shri Narendra Modi chairing the meeting of the National Committee on Nation-wide Celebration of 125th Birth Anniversary of the Dr. B.R. Ambedkar, in New Delhi on July 23, 2015. The Prime Minister, Shri Narendra Modi, today chaired a meeting of the National Committee for Celebration of the 125th Birth Anniversary of Dr. B.R. Ambedkar. Members gave their suggestions on how the celebration should be organized throughout the year. The Prime Minister thanked the members for their suggestions. He said efforts should be made to raise even greater global awareness about Babasaheb Ambedkar and his great contributions for the welfare of society and humanity. He said this could be accomplished through initiatives such as annual quiz competitions for schoolchildren. He said greater awareness should also be generated about Dr. Ambedkar's vision for India's industrialization, and its necessity in order to generate employment for the poor and deprived sections of Indian society. Union Ministers Shri Rajnath Singh, Smt. Sushma Swaraj, Shri Thaawar Chand Gehlot, Shri M. Venkaiah Naidu, Shri Ram Vilas Paswan, Shri D.V. Sadananda Gowda, Shri Suresh Prabhu, Dr. Mahesh Sharma and Shri Jual Oram were present. Sardar Charanjit Singh Atwal, Dr. Narendra Jadhav, Dr. Siddalingiah, Shri Milind Kamble, Shri Bhiku Ramji Idate, and Dr. Bhadant Rahul Bodhi were also present. 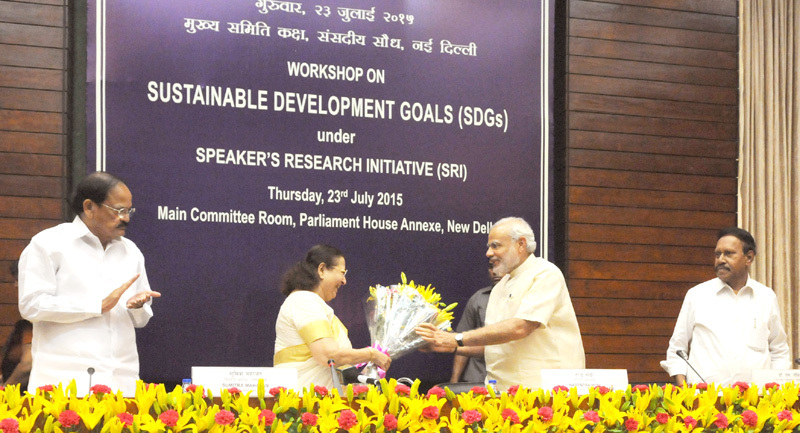 The Prime Minister, Shri Narendra Modi being presented a bouquet of flowers by the Speaker, Lok Sabha, Smt. Sumitra Mahajan, at the Workshop on Sustainable Development Goals, at Parliament House, in New Delhi on July 23, 2015. The Union Minister for Urban Development, Housing and Urban Poverty Alleviation and Parliamentary Affairs, Shri M. Venkaiah Naidu is also seen. The Prime Minister, Shri Narendra Modi, today attended the inauguration of a workshop on Sustainable Development Goals, as part of the Speaker's Research Initiative. The Prime Minister appreciated the initiative taken by the Lok Sabha Speaker Smt. Sumitra Mahajan, to make the Members of Parliament aware of issues on a specific topic through the aid of experts in the area. He said people have a lot of expectations from the MPs, and therefore, MPs need to work towards fulfilling these expectations. Praising Member of Parliament Shri Shashi Tharoor for a recent speech at the Oxford University, the Prime Minister highlighted the importance of effective arguments in a debate. The Lok Sabha Speaker Smt. Sumitra Mahajan and the Minister for Parliamentary Affairs Shri Venkaiah Naidu were present on the occasion. The event was organized at Parliament Annexe. The Prime Minister, Shri Narendra Modi has remembered Chandra Shekhar Azad and Lokmanya Tilak, on their birth anniversaries. "Remembering pillars of our freedom struggle, the brave Chandra Shekhar Azad and the great Lokmanya Tilak on their birth anniversaries", the Prime Minister said. The Prime Minister, Shri Narendra Modi has greeted the people of Egypt on their Revolution Day. "Greetings to the people of Egypt on their Revolution Day. India is fully committed to a stronger partnership with Egypt", the Prime Minister said. obtain clearances from Atomic Energy Regulatory Board (AERB). Nuclear safety and security aspects are reviewed by AERB before giving clearance for various stages of the projects from siting onwards. AERB has specified safety and security requirements in its Codes & Guides which are in line with international standards. AERB has rigorous process for reviewing Nuclear Safety and Nuclear Security aspects of nuclear power projects through multi-tier reviews, apart from periodic regulatory inspections, to ensure adherence to the requirements. Various electronic surveillance and security measures have been taken at all nuclear power plant sites of NPCIL. The list of nuclear power plants in operation and under construction is as given below. The total amount allocated in this regard in the last five years is approximately Rs. 225 crores. Adequate allocations have been made for installation, upgradation and maintenance of various surveillance equipment and other security measures at nuclear power plant sites. The country has 21 nuclear power reactors under operation with an installed generating capacity of 5780 MWe. Thirteen (13) reactors with a total installed capacity of 3380 MW viz., TAPS-1&2 located at Tarapur, Maharashtra; RAPS-2 to 6 located at Rawatbhata, Rajasthan; KAPS-1&2 located at Kakrapar, Gujarat; NAPS-1&2 located at Narora, Uttar Pradesh; and KKNPP–1 located at Kalpakkam, Tamil Nadu are under International Atomic Energy Agency (IAEA) safeguards and are eligible for imported fuel. These reactors are operating at rated power. However, one reactor, RAPS-1 located at Rawatbhata, Rajasthan (100 MW) is under extended shutdown for techno-economic assessment. Eight (8) reactors with a total installed capacity of 2400 MW viz., TAPS-3&4 at Tarapur, Maharashtra; MAPS-1&2 near Chennai; and KGS-1 to 4 at Kaiga, Karnataka are fuelled by indigenous fuel. They are presently operated close to their rated power, matching availability of fuel. The Government had made efforts to augment indigenous uranium supply by opening of new mines and processing facilities thus narrowing down the demand-supply gap for reactors using indigenous fuel. As a result, there has been a progressive improvement in capacity utilisation of nuclear power plants. To meet requirement of fuel for reactors under IAEA safeguards, agreements for import of uranium are signed with M/s Navoi Mining & Metallurgical Combinat State Company (NMMC), Uzbekistan; M/s JSC TVEL Corporation, Russia; M/s NAC Kazatomprom, Kazakhstan, and M/s CAMECO, Canada.